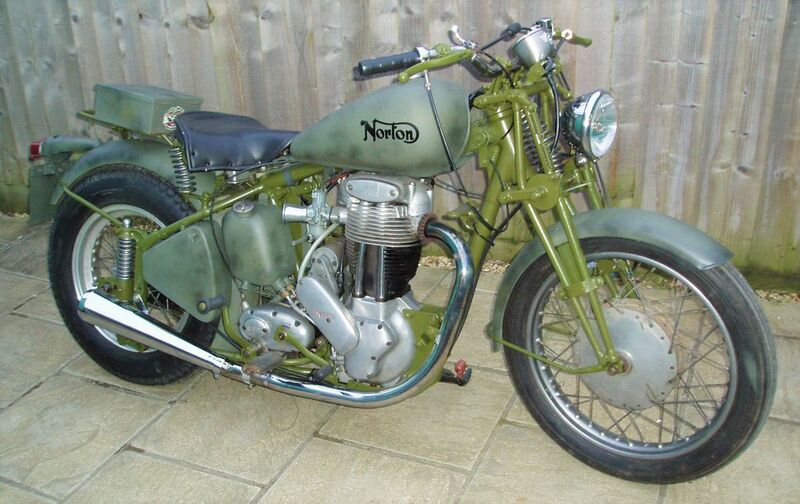 Just a kind word of thanks to you both for the excellent service I received when purchasing the Norton. The motorcycle was delivered earlier this week and finally had time to do the once-over and get it on the road...lovely machine. Thank you very much for the bike, it's superb. Also thanks for the very nice calendar. Attached you will find a picture of it in front of my house. A long journey yesterday, arrived home safely, in total a 492 mile round trip! It was great to meet you guy's yesterday, I was made most welcome and was not disappointed when I toured your Aladdin's cave of nostalgic motorcycles, machine tools & facilities. I'm delighted with my Bantam purchase, exactly what I've been looking for & I'm looking forward to working on her this Winter. Thanks again for your assistance in loading the bike into my car, I drove all the way back home with a grin on my face as I took in the vintage aroma of oils, petrol etc from the bike!! Thank Jo for her excellent advice on the local roadworks & the welcome mug of coffee! In summary, a great day out. Thank you very much for the deal. All went well, bikes are in our garage and both works as said. I started both of them easy ;). Keep you informed and stay in touch. Hard to believe it's almost a year since I collected my Sunbeam S8. Have been working on it off and on throughout the summer and finally took it out for a shakedown run last Sunday (Just charging to sort). Here are some pictures of the (almost) finished bike hope to put some miles on it before winter kicks in. 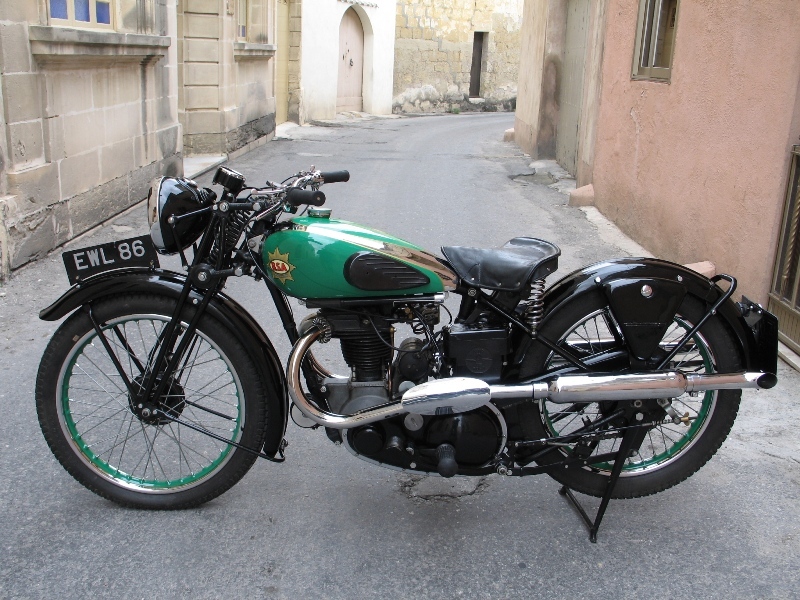 you delivered a BSA A7 -49 (reg. LTA 413) to me in 2008. It took that eight years, but finally I have managed to finish the restoration of that bike. I send two photos attached showing how it looks now. 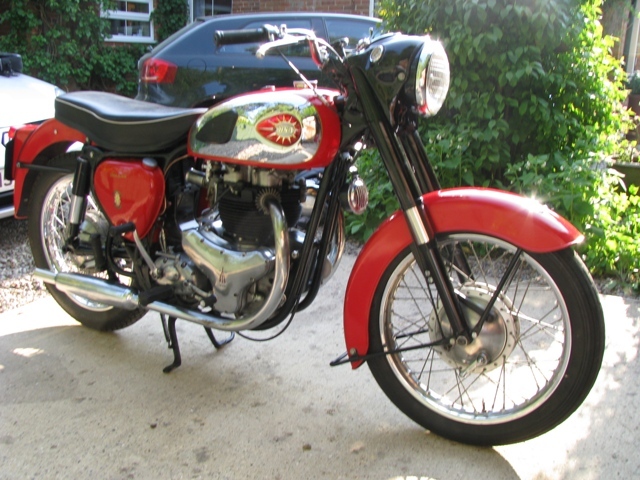 I have had the BSA inspected by local authorized museum vehicle inspectors, and will get it now registered as museum vehicle. George loves his new Norton. We rode to the Red Lion at Lowick today. I attach some photos. Andy, I thought you might like this picture, you sold me this bike in 2013 it's 456 YUR after full restoration by me. I took it to Normandy in June 2014 for the D Day Commemorations. I still have the bike, love it, and have got the bug again. Just thought you might wonder sometimes what happens to all the bikes that pass through your hands. By the way saw you on Shed and buried. Just confirm the sidecar arrived last Thursday. 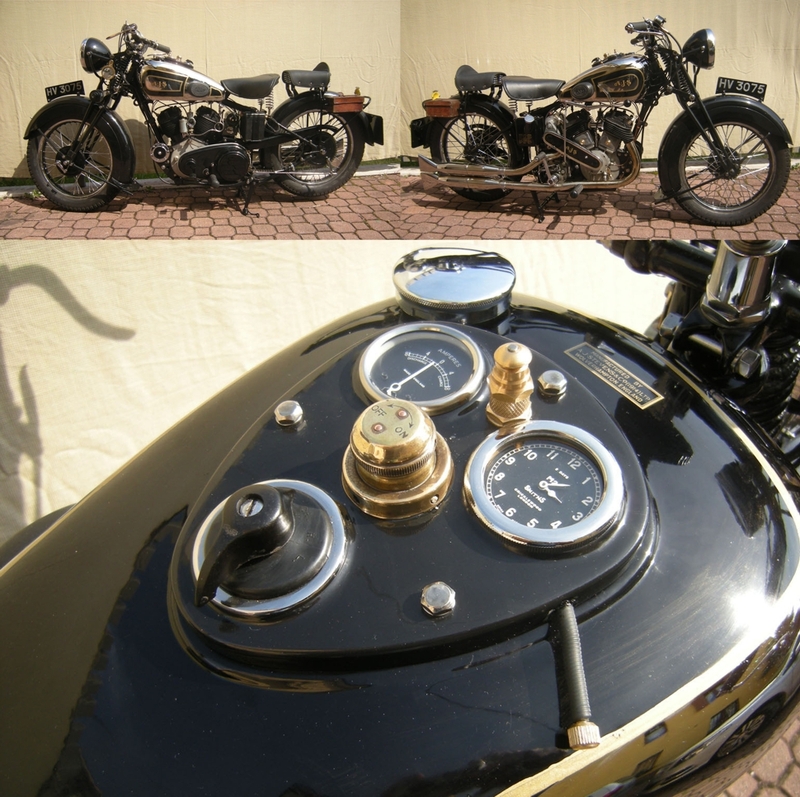 A smooth delivery by Peter Ranson and i'm really pleased with the sidecar. Scott arrived well yesterday, carefully dispatched from you. We already started bike, it's amazing bike, technically special in it's time and enrich my collection of the historic motorbikes. I'm very satisfied and I will recommend you to my friend. 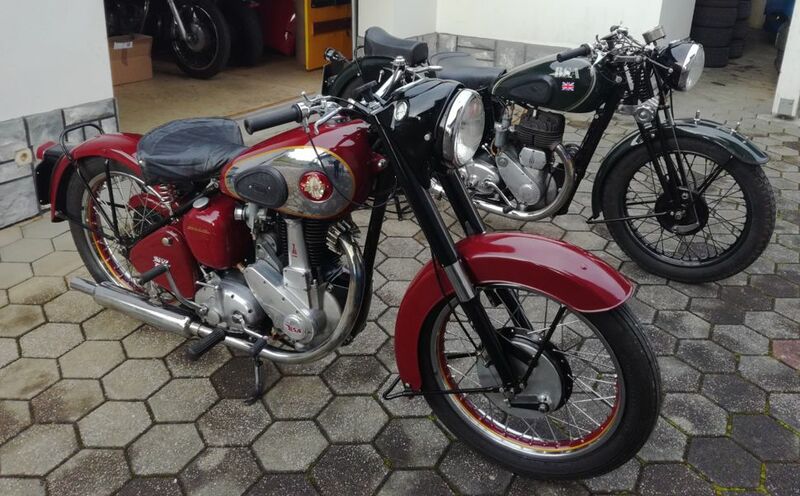 At Monday I got a great Christmas present, the BSA A10 finally arrived at my home – really great bike. Unfortunately bike season is over (I know some very hard people still driving), but this give me the opportunity to get familiar with the A10 and get it through Swiss MOT before next spring. Thanks a lot for the calendar and all the effort to correct the paper – I’m happy that I can register the A10 with the correct frame number. Remark: I decided to repair and not restore the Empire Star because of the very nice patina the bike has, but already figured out, that this is even more demanding then restoring. Thanks you for organizing delivery, Chas is an excellent and quick delivery man , I'll be back in touch perhaps for an another bike. Many thanks for the deal this morning. we both greatly enjoyed our time in your "Aladdins Cave"
I've done 30 miles on the Triumph this evening and it’s a gem - smooth, quick, oil tight and a real joy to ride. Just a change of oils and a clean of the filters needed I think. and has climbed with Marylène & Pascal many Cols of the famous "GRANDE ROUTE DES ALPES"
got from you in January is now on the road and I'm chuffed to bits. Here you can see my lad and QC just getting her ready for a run out. I hope you are all keeping well and enjoying the sunshine. Hi there, I thought you may be interested to see what I have done to a bike you once owned, it seems to me that many owners in the past have stripped the engine and gearbox down and found the work needed was beyond them both in money and skills required to put this bike back on the road. But I like a challenge and having been a toolmaker for almost fifty years came in very handy, a new timing side axle had to made along with oil pump drive shaft, valve guides, kick start mechanism, new middle gear plus various other parts. It is now on the road and runs perfectly, shame about the brakes.........scary. I doubt you will remember me but we have done business in the past last I think 35 Bluestar BNA346 that you purchased from me. I do a fair bit of travelling but wanted to say how much I enjoy your website & constantly updated info, lots of work for Jo no doubt. Just a quick email to say thank you, the Panther has just arrived and the sun has just come out.......now that's what I call customer service! I am chuffed to bits! Thanks for organising delivery and sorting everything out, I'll be back in touch when I've saved enough for the next bike. Thank you for your kind attention and your professional care of customers. The bike has arrived to Spain this very morning. Everything was perfect. We have started the bike and have a little ride. A cleaning of carb will improve riding though I think we are restoring completely. It is our second Triumph 6/1. 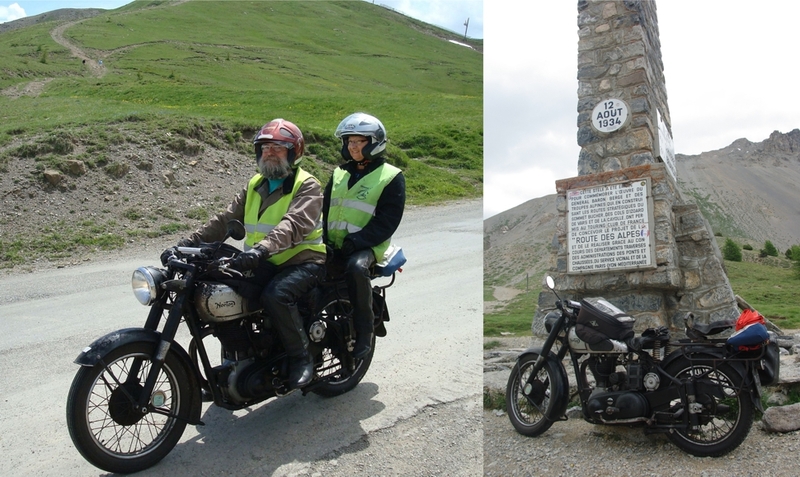 I am sending a pair of photos showing my father and me with both Triumphs. Thank you very much. I am sure this won´t be our last bike from you. Andy just a line to say how pleased i am with my latest purchase the velocette mac . it proves how well these machines were built it handles and goes well for a fifty plus year old machine and have done well with finding this one . all the best dave kirkham dale abbey derby. 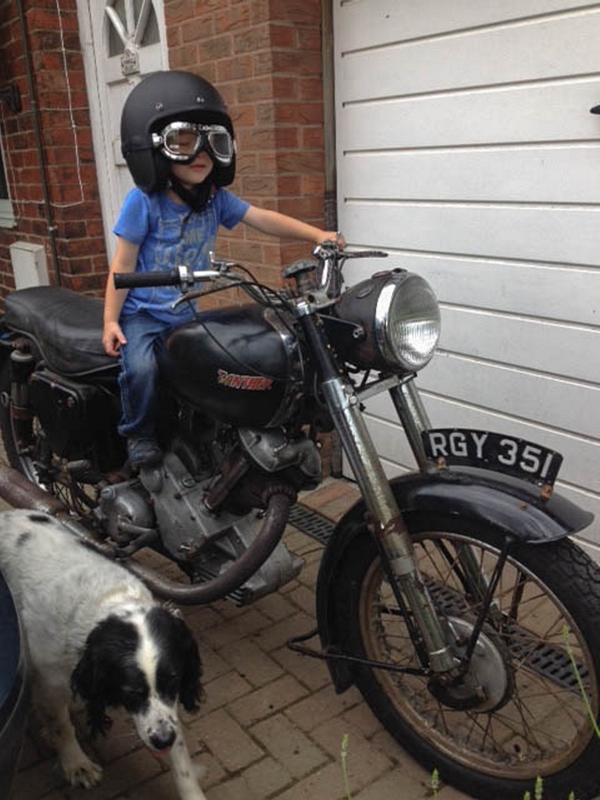 Hi Andy, Thanks very much for dropping the Jawa 353 off at my home on your way back from Kempton Park, The Jawa has way exceeded my expectations, It started after a few kicks after turning on the petrol and choke. Pleased or what. Absolutely chuffed. It won’t be restored, only ridden, probably to a few European events; I hope to ride it up to Framlingham in a few weeks when work dies down. I wish you in good health and fortune. 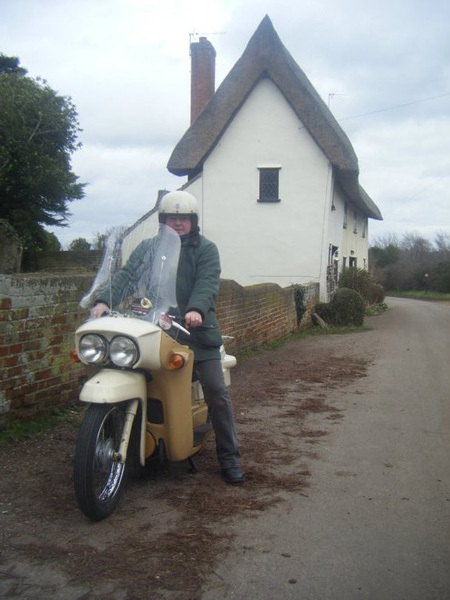 Just covering 500 miles on my BSA Sloper sv 557 cc since October. and found no problem at all. I would say the bike is in the best condition.this is my first bike that almost trouble free(except the leaky gas tank which I've done repaired),and for my collection this Sloper is my fourth BSA . I really satisfied with the performance.. Last December when I attend local classic bike event. the trip pass through mountainous area. the Sloper easily past a group of single cylinder BMW in steep road.that was fun. And for New Imperial,at first I was making mistake overfill the gearbox oil.so the clutch was slipping then I opened the clutch and cleaned it up. but now the bike is happily cug over and sometime I ride it for commuter nearby hometown. Hope I will make another purchase in future. Took delivery of bike thurs eve am very pleased fired it up this morning sounds ok, have a good christmas and a happy new year. I hope you a well. The bike arrived safely this morning with Peter , it is fantastic. I would like to thank you very much for all of your hand holding because as I said before I am complete novice. I would have no hesitation in recommending you in the future and hope to do business with you again. Is the documentation with the bike on its way to me ? Just to let you know the bike arrived safely and I picked it up today. I do not have a printer/scanner/copier so if you still need a copy of the arrival invoice I will find a way to send it to you in a few days. Regards, Stephen. I waited until Brian had left and then had a quick burst round the block. I had just shifted into second when I had to effect an emergency stop. It stopped almost on a sixpence!! Fantastic. It has a nice feel to it and responds as I expected. I am about the same height as Brian and at rest I am on toes. Not a problem. My half of the registration document will be in tonights post. Do you remember me, before I bought your old motorcycle 1933 Francis Barnett 250, I just got license in Hong Kong, & I upload the photos in this email. I hope your business does well. A satisfied 75 Year old Customer from South Africa. The WM 20 is going well. P.S. Neal did a fantastic crating job. Just a Quick Email to say the Squire chair and body,our Nipper picked up Saturday morning for me Absolutley Spot on ! Thanks very much, and a very reasonable price as well! Hope your holiday was nice. I just wanted to thank you. My father received Matchless on 23rd of May and he was very happy with it. It was very well packed and condition was as described. I'm more then pleased with the bike and I'm sure I will be contacting you soon, as I still have some space in my garage. It was a pleasure and very professional to do business with you. Thanks the bike arrived in great order. Thank you for your professionalism. Please find attached pictures of 3TA arriving in Penang. Thanks to all who made it possible. The bike has now entered the restoration process and will be returned to its former glory + +. Note to Andy - That was one lulu of a crate you packed the bike in, after half an hour we gave up the spanners and reverted to hacksaws. Also the bike arrived no problem but we seem to have lost the mechanic you sent out. Thanks again gang that really was a blinder. I must say I am very pleased with the Triumph I bought from you yesterday. The little beastie loves being ridden. I had a small hiccup at Hacheston but the dirty connector block was soon sorted out by the RAC and I was off again flying all the way to Chelmsford. Took it to the club last night and had a few of the guys drooling over it. (Had to fight them off............its mine, I told them) Hope to see you soon to bring up the old duel seat and carrier that I had on the M21. Andy, bike arrived yesterday, started first kick. Many Thanks. Don't expect to break down, but might be interesting to see what the RAC would say about fixing an AA bike! Insurance was horrific, works out at £11.29 fully comp. Or should that be £11. 5s. 9 1/2d? Hi Andy the Douglas is arrived !! It is all ok !! I've already run with the motorcycle , is wonderfull !!! Best regards and thanks !! Im just writing to tell you how happy I am with the Bantam. You said it was a good one, and so far the more miles I do, the better it seems. It's coping with the Peak District hills much better than I thought too. Great news! And just in time, the new law is effective 1st of January so I am well pleased. I will send you the 30 € cash today with my best wishes to you and your company. Maybe we can do some business in future. I will certainly recommend you to all my collector-friends. After nearly 25 years this is what I call service with a capital S! Thank you for the documents, I 'm very happy with the details from repairs of the tiger. Joris, Tess & Sandra. Belgium. We are very pleased with the machine in all aspects being just as you described and what we had been looking for. Hi Andy / Jo - hope all's well. The little 350 is fabulous - thank you. I've had her up to an indicated 50 now and I've named her Edna. Footman James want me to have it valued by an expert. Would it be ok if I sent you the papers with an envelope to F. J. for you to value it for me? Otherwise it's a lovely little bike. I've had many "thumbs up" and smiles from old fellas, and in a way it's made their day, as well as mine. 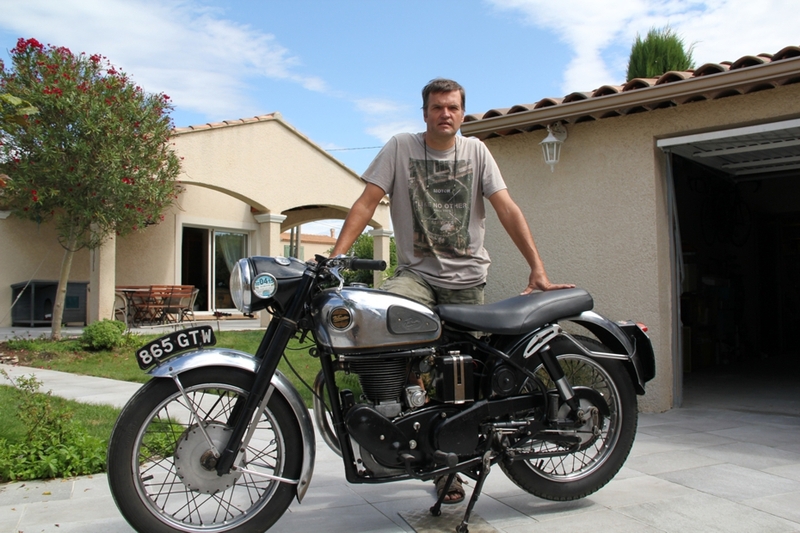 Just sending you a short email about the Velocette Vogue I bought from you recently. I am extremely pleased with it and I'm enjoying some great rides at a very slow pace. Perfect for back lane pottering. I have been surprised that it manages to reach an indicated 55mph on many occasions and I cannot help but be amazed that it still carries on given the weight it has to carry (me plus the bike's weight). The brakes, as all reports old and new relate, are a different matter – even Classic Bike described their effect as "negligible" way back in 1983 and I cannot disagree with their assessment! Still, think ahead, take it slow and enjoy life! What a great bike – many thanks again for acquainting me with this wonderful device! Picture attached of a recent outing. Just want to say a big thank-you. The bike was everything you said and more. We were out on it yesterday and it ran like a dream. We were impressed with the delivery service and you didn't mind us giving you a call with our daft questions. We also received all the documents yesterday. You have made two aging bikers very happy. I'm writing to let you know how pleased I am with the BSA. On the rare occasions that I've been involved with dealers in the past, I've been disappointed. You are very much an exception and I appreciate your honesty and patience. 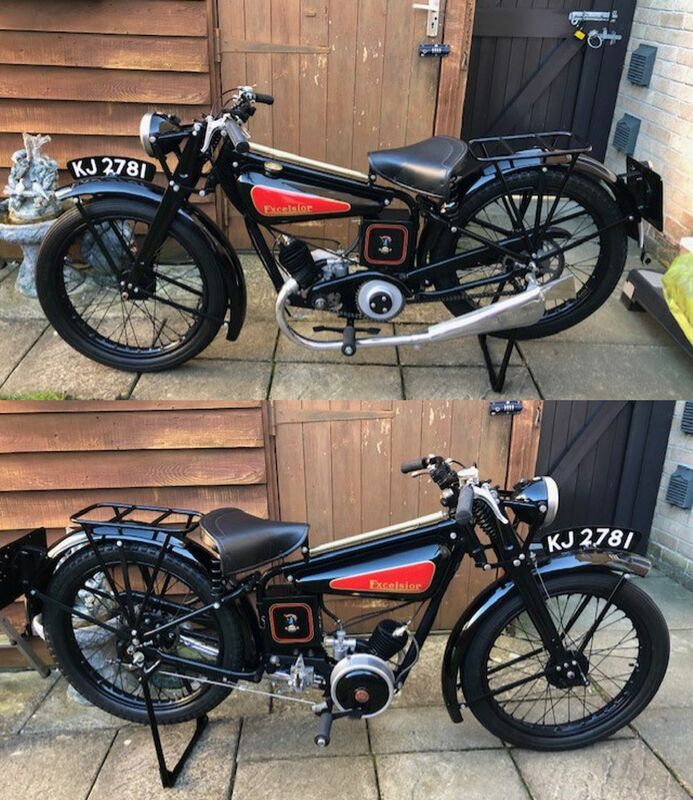 I was delighted when you reduced the price - thank you for delivering the bike and starter to John, I hope I haven't bitten off more than I can chew! Hope to see you at Kempton again. 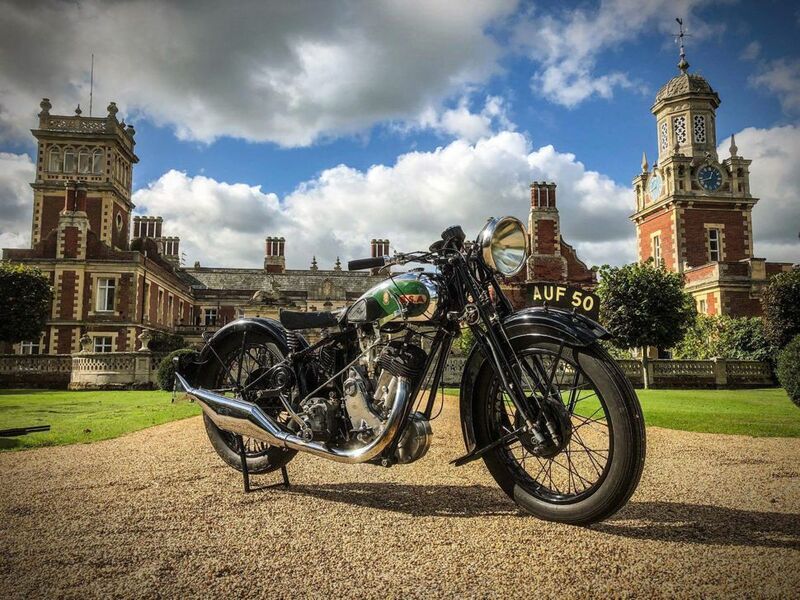 Thought you might like this photo of my BSA which I bought from you earlier this year. 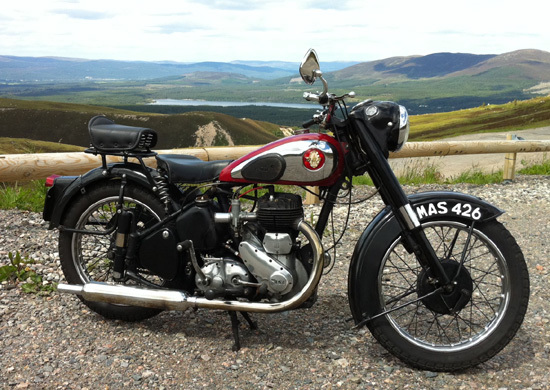 The photo was taken on Sunday at the cairngorm mountain carpark. I use the motor bike almost every day.